In terms of general specs and features, the GoPro 2 and Drift HD are almost the same. They both shoot Full HD 1080p, and have all the other resolution options in between. Both have variable frame rates e.g. 30 fps and 60 fps if you want to do slow motion. Quality of video and sound does lean towards the GoPro 2 after seeing other reviews, videos and comparison articles. Obviously, that quality should be a top priority when considering which one to buy. That isn’t to say the Drift HD doesn’t deliver great quality, just that GoPro 2 has been known to excel marginally in this category. Size and weight do vary a little here – but not by much. Since the Drift HD is a much smaller than it’s older brother, the Drift Stealth, it is now a very similar size to the GoPro. Obvious differences are in the design and color. Prices are also relatively competitive, and you won’t find much difference on price between the different online store that offers them to the buying public. At this point in time, GoPro 2’s RRP is $299.00 (Outdoor, Surf, Motorsports) basic package, but can be picked up at a slight discount for around $284 at Amazon.com. The Drift HD is selling just about everywhere for $299.00 – whether you go to Amazon or other Online retailers. $15 difference in price is not huge, but for some, it may make their decision to purchase lean towards the slightly cheaper GoPro 2 Hero – but don’t forget about all the add-ons for the GoPro 2. At first looks, the GoPro 2 maybe a little cheaper or the same price depending on where you shop – but the Drift HD comes a slew of built-in features that otherwise you’d have to pay extra for with the GoPro. If price and specs are an issue, then it’s very important you check every feature both brands have to offer; this way, you will be able to determine which of the two truly meets your needs and your budget. Viewfinder – A lot of users think of the viewfinder feature to be highly important, especially when they are taking outdoor shots that focus on zoom detail. The Drift HD offers an advantage here by having the viewfinder feature available as a built-in function, while the GoPro 2 has it as an add-on only. GoPro 2 users are thus subject to buying an add-on accessory in order to enjoy the features of the viewfinder mode. Remote Control – Users who want to enjoy the hands-free comfort of a remote control to turn the camera on and off have an advantage without extra cost with the Drift HD. With the included remote control, you are able to take pictures, set camera focus and shoot videos-and even pair the unit with other cameras via wireless control. This feature can be very much useful when taking high risk scenes. The GoPro 2 meanwhile has the wireless function available as an add-on feature, similar to the add-on viewfinder. Bluetooth – The Bluetooth function is not common in most outdoor cameras, but the GoPro 2 has it available as an add-on device that can be attached to its units. At present, the Drift HD doesn’t have this feature available in their units. Resolution – Resolution is highly important for taking still photos. Camera users who are more inclined to enjoy instant, crisp images may rely more on the GoPro 2, which comes in an 11 megapixel resolution. The Drift HD meanwhile has only a 9 megapixel resolution. Weight – The weight of the camera is likewise essential; it is an indicator of how convenient can the camera be used for travel. The GoPro2 has a weight of 168 grams, as compared to the Drift HD at only 125 grams. Some users prefer the heavier camera however; this is because the greater weight offers better stability especially when mounted on a tripod or placed in a stable surface for shooting videos. Lightweight cameras meanwhile are more convenient for handheld shots, and still images. Waterproof – Both the GoPro 2 and the Drift HD are waterproof, with the former able to reach up to 60 meters. 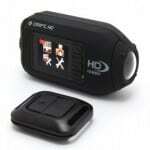 The Drift HD meanwhile has a waterproof case available as an add-on feature, and it is usually purchased separately. This makes the Drift HD more ideal for use in taking underwater shots, particularly in shoots that go beyond 60 meters below sea level – but the GoPro 2 will suffice for any water level activities like surfing, skiing or general fun around water with the casing supplied in the box. Rotatable Lens – Users who wish to explore on the different angles and zooms may find good use of the Drift HD because of its rotatable lens feature. The GoPro 2 meanwhile has a static lens, limiting the rotation and leaves you having to be more creative with how you mount the camera. If you just want a simple to use camera but sill have all the features already built-in to a small pocket size helmet camera – then the Drift HD is a no-brainer here. Straight out of the box, you’ve got a high performance action camera and can forget about all the hassles of carrying around attachments with the Drift HD. If you’re a hard-core helmet camera enthusiast and money or carrying around accessories is not an issue, then go with the GoPro 2. You’ll find the sound and video quality just that much better and with the ever expanding range of add-on available for it, the GoPro Hero 2 gives you the freedom to create a monster for any application. If you’re looking to buy the GoPro 2 or Drift HD, I recommend you check out these online stores for best prices. Thanks for reading my comparison and I hope it helps you decide on which camera is best for you.